Mobile homes Simuni are located in camp Simuni. Village Simuni is located between town Novalja and town Pag. Mh Villa, Villa Riviera, Cottage, Bungalow is 200-250 m from the sea. Houses are older. The central beach of Camping Šimuni is especially appealing to divers and adventurers. It is surrounded by floating decks, and there is a sunken fishing trawl boat nearby-an ideal spot for exploring the rich underworld of Adriatic. The Golden Beach is covered with sand and pebbles, aqua aerobics takes place here every day, paddle boats and kayaks are for rent, and you can jump on the trampoline. The beach deserving of its name. All mobile homes in Camping Village Šimuni have a roofed terrace with garden furniture, parking place, living room combined with a fully equipped kitchen, a stove and a fridge, and each mobile home has a satellite TV and air conditioning system. Rent or park your mobile home in our camp and come whenever you wish to your world of sun, sea and Mediterranean. The view from the terrace reveals the charms of Pag archipelago, and spacious homes guarantee comfort. Choose between four categories and rent a mobile home in Camping Village Šimuni: COMFORT, LUX, DELUX and KORNAT. Mobile home for 6 persons. 2 bedrooms (1 bedroom with 2 separate beds 2x70x190 and another bedrooms with big bed 140x190). Pull-out sofa is in fully eqipped kitchen/living room. Bathroom. Terrace with garden furniture. Mobile home for 6 people. 2 bedrooms (1 bedroom with big bed 140x190, second bedroom with separate beds 2x70x140). Fully equipped kitchen/living room with pull out sofa 130x190. Terrace with garden furniture. Mobile home for 6 people. 2 bedrooms (1 bedroom with big bed 140x190, another with separate beds 2x70x190). Fully equipped kitchen/living room with pull-out sofa 130x190. Terrace with garden furniture. Mobile home with 3 bedrooms (1 with big bed 160x200, second and third bedroom). Big terrace 15 m2. Bathroom. Fully equipped kitchen/living room. the hidden gem of the Adriatic and the island of Pag, extends over gentle slopes covered with Mediterranean vegetation. Camping pitches are situated in a Holm Oak and pine forest, at stepped terrain that descends slightly towards camp beaches. In our camp, you can also find free unfenced area for camping, with water and power connections, while at the beautiful sea point, right next to the blue sea shore,you can camp and enjoy the morning peace and waves. 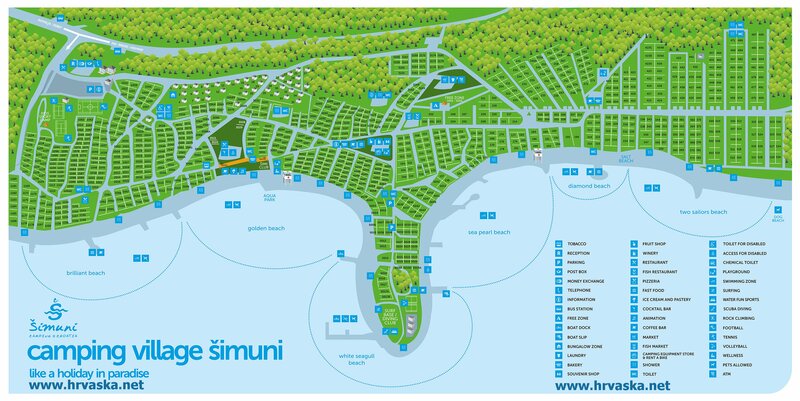 Camping Village Šimuni offers the possibility to accommodate mobile homes or caravans throughout the entire year. Our professional animation team organizes workshops for children every day. Workshops are creative and stimulate endless children’s imagination. Children will enjoy playing and hanging out, right by the sea coast. Apart from workshops, kids just love different sports and entertaining tournaments that we organize every day, and give away attractive prizes. Little dancers and future stars can show off their dance moves in our Mini Disco - the only club in the world where no one cares how others dance, but we all laugh to the rhythm of the music. Let our animation staff take care of your kids and trust us, it will be a summer filled with games and joy, and vacation you’ll never forget. Sports competitions, cooking contests, karaoke…there’s something for everyone. What kind of fun would that be without a celebration, and in Camping Village Šimuni we know how to party. We would like to single out the big party we organize every year to celebrate the birthday of the camp. All those wishing to spend their holidays in peace and quiet have no reason to worry –although we are known for our celebrations and joy, we take care not to disrupt the peace and house rules of the camp. No towels and bed linen. You can bring or hire bed linen. 50 % - from the day when you make a reservation till 15 days before arrival.